The Exclusive Option Leather PCM Navigation Radio Module features a rich full leather surface. This rare Leather Option was a very expensive and rare option from the factory, only on the most exclusive model Porsches such as the 911 Sport Classic and exquisitely specified cars have this. The plastic PCM volcano trim is not the most fitting of a Sports Car of this caliber especially with a car that features other Exclusive Leather Options. The entire plastic PCM face is replaced with a intricately wrapped leather one matching your interior color. This Leather PCM is the ultimate way to highlight the dash console area giving your Porsche the most exclusive and outrageously detailed craftsmanship available for your interior. 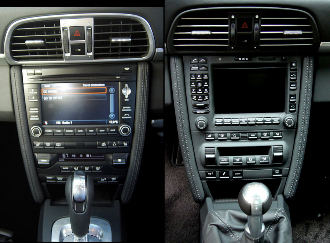 Don't forget the matching Leather Matching Climate Control, Switch Panel and Lower Cubby Trims. Our Leather PCM's are sold on a core exchange only.